I get it, already! Social media is about being social. “But what do I say?” Yesterday I met with a client who asked me this very question. The very outgoing, personable, bubbly woman, who never seemed at a loss for positivity, was stuck when it came to conversing with clients via Facebook. This new form of social media communication can be intimidating for individuals who are just getting their feet wet. Talk to your Facebook fans as if you were speaking directly to them. What information are clients requesting? What are their frequently asked questions? A local wedding florist, Mieke’s Magic Floral Design, posts information about wedding trends including bridesmaids and wedding dresses, centre pieces, tuxes, traditions, and oh… yes wedding flowers! She also posts photos of weddings that included her flowers, pictures of wedding shows and her recent marketing. This component adds a personality (or voice) to your Facebook Fan page. Jeannie Campanelli – Inner Confidence Life Coach posts videos, quotes and photos that inspire her. This type of interaction allows potential clients to understand her personality and comfortable with her attitude, values and opinions. What business activities are you up to? Share business adventures with your Facebook fans! Welcome new fans to your Facebook page. Announce upcoming events, seminars and workshops. Post photos from your shop, networking events, new items. I hope this inspires you to talk to your Facebook fans this weekend! Learning the Language: Number Sign. Pound Symbol. Hashtag. This (#) is a hashtag. It is used to identify key words, topics, locations or kitschy slogans within a tweet. Hastags can occur anywhere within your tweet – beginning, middle, or end. While some people pepper their tweets with hashtags with the hopes of appearing in more search results, it is recommended to use a maximum of two. Hashtag spammers, need not apply. Clicking on a hashtag within a tweet will show you all the other tweets in that category – the same as if you were to use Twitter Search, which is found at the top of your computer screen. It is important to highlight that a hashtag can be creative and unique! For example, in Kingston, Ontario, Canada the most popular hashtag is #ygk. Ygk? What does that mean? If you’ve ever used the Kingston Airport you would know – as it is the local airport code. The reason behind the popularity of this hashtag is that there is a Kingston, Nova Scotia, Kingston, Jamaica, and a few recording artists with a similar name. If you search “Kingston” you may not get the right one. 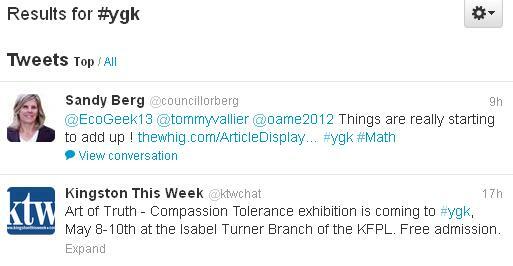 As a result, local Tweeters began hashtagging #ygk as a means to identify their location. Hopefully this enlightens the world of hashtags. It happens – we have a bad experience and we are upset. The waiter took too long to bring us our meal. The cashier is texting rather than attending to our order. The line up in the drive thru is too long. Tempers flair and we turn to the closest thing to us to vent our frustrations – our phone. We tell twice as many people about a bad experience than if we had a good one. But I doubt that number includes our Twitter followers, Facebook fans and YouTube viewers. It is important, therefore, to think before you post anything as it may result in ramifications that you were not expecting. A few days ago Brampton teen posted a rant on her YouTube account regarding a particular racial group of students at her school. The video was appalling and has been removed because it was deemed in violation of YouTube’s policy against hate speech. The teen did not have the foresight to think of the results of her actions. As a result, the teen has had to deactivate her social media accounts and cell phone because people upset with her comments were threatening violence upon her. While this is an extreme example, it highlights the power of social media accounts and the attention they can bestow upon you. Remember to think of the results of your comments before you post, tweet, or upload – especially if you are angry or upset with a situation! I love social media – it’s my business to love it, learn it, and teach it. While many individuals believe that social media will reach a younger target audience, according to Facebook women aged 55+ is the largest growth segment. Better yet, social media allows businesses to interact one-on-one with future and existing customers and clients! Social media is… well… meant to be social! But while this new marketing method has become a focal point in the eyes of many businesses, it is important not to abandon your existing marketing strategy. Many businesses I work with crave a presence on social media applications like Facebook and Twitter. While working with these clients I highlight the importance of integrating this new marketing method alongside existing traditional marketing methods. Essentially, don’t throw the baby out with the bath water! Social media marketing is a complement to your existing marketing toolkit. It is important, therefore, to nurture relationships using traditional marketing means. This afternoon I have set aside time to write thank-you cards to my clients, and individuals who refer clients to me. 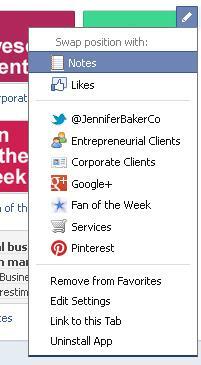 This small personal touch shows clients and colleagues that you value their business and/or referral. While much of my interaction occurs via computer-to-computer, I believe it is these small touches that help build relationships.